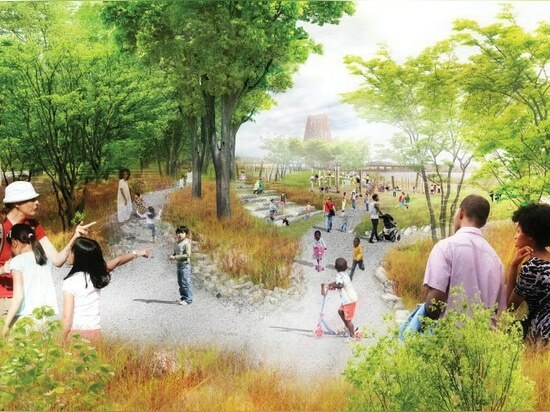 studio gang has teamed up with landscape architecture firm SCAPE to redesign a waterfront park in memphis, tennessee. 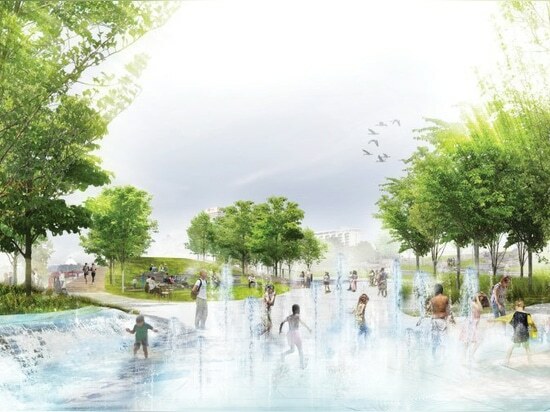 tom lee park was one of the five zones included in studio gang’s 2017 memphis riverfront concept, a masterplan for six miles of the city’s riverfront that was shaped through a series of community engagement workshops, meetings, interviews, and surveys. 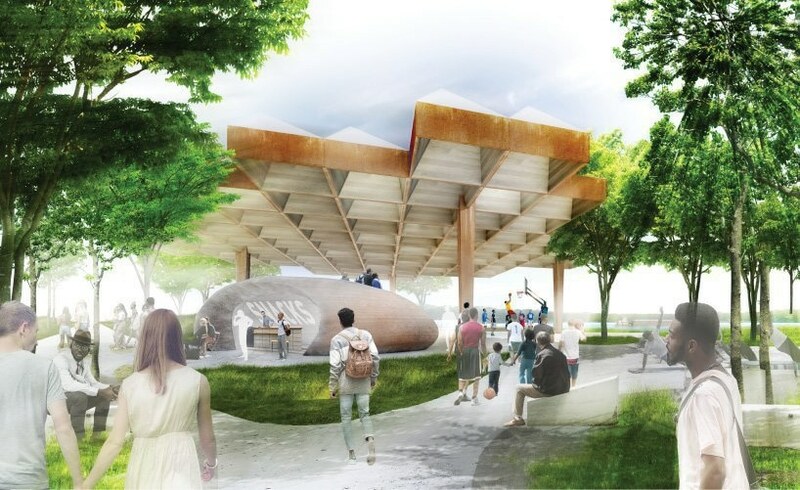 studio gang and SCAPE developed the park’s design over a long period of consultation with community groups, key park stakeholders, and incorporates the ideas and input from more than 4,000 voices, including local students from north and south memphis. 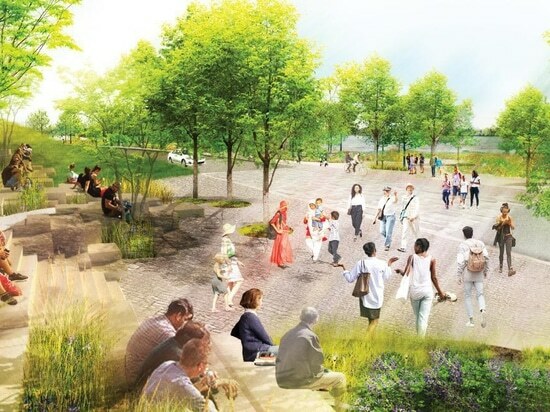 the park’s 30 acres are laid out as a series of four distinct zones — defined by topography, vegetation, pathways, and architecture — that flow together to support a range of active and passive uses. 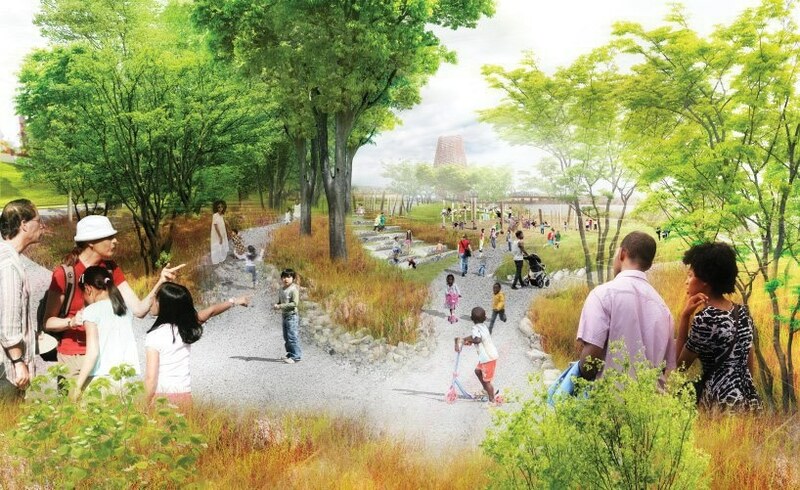 the zones are inspired by unique features of the mississippi river basin and together create a template for diverse civic spaces and ecological revitalization in downtown memphis. from a health perspective, paths are designed in loops to encourage all levels of physical activity and will include a one-mile fitness loop with workout equipment. 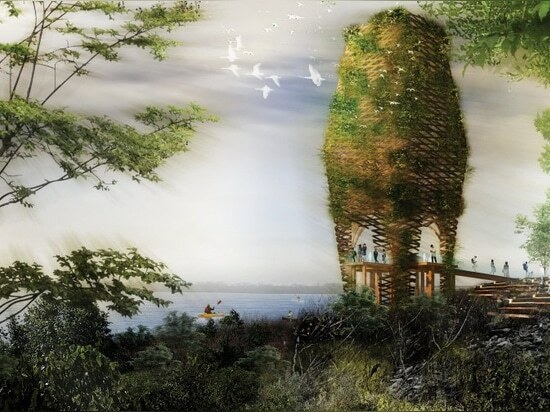 the design also prioritizes environmental health by integrating natural and technical systems that will mitigate water pollution, provide habitat for wildlife, harvest energy using photovoltaic panels, and collect stormwater for re-use. 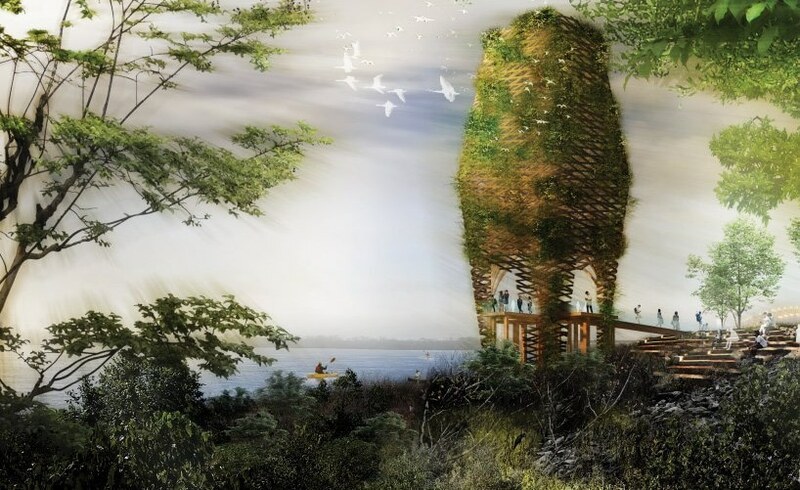 regionally-appropriate flora and fauna contribute to the ecological restoration of the riverfront, and new plantings improve tree canopy and shade for park goers. 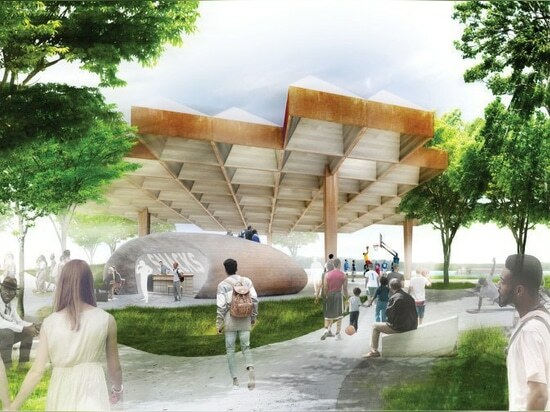 in early february 2019, memphis river parks partnership opened the tom lee park engagement center at beale street landing, which hosts a large architectural model, renderings, animations and even virtual reality walkthroughs of the future park, which will stretch from the top of the bluff to the bank of the mississippi. 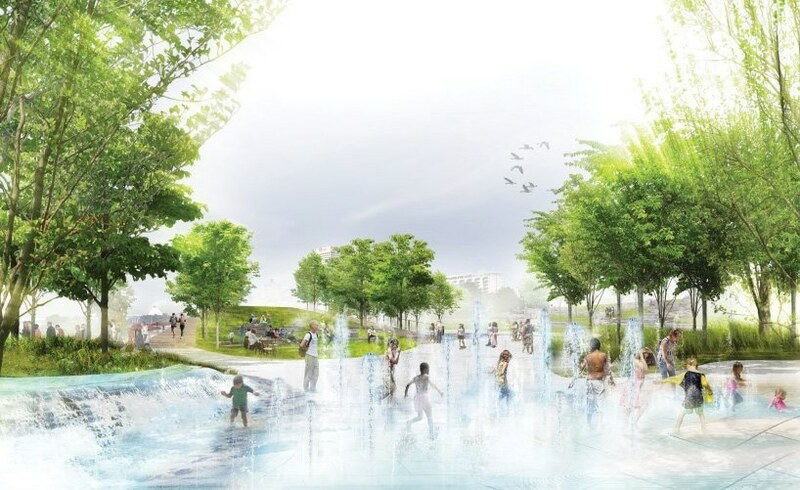 memphians are invited to view and respond to the new design for tom lee park, which will continue to be refined over the coming months. construction is anticipated to begin in june 2019 and is forecast to conclude by the end of 2020.